The 2-room comfort apartment is located on the ground floor of a new building (2010) in Luisenstrasse. It is characterized by an open floor plan, bright and friendly rooms and the 16 sqm large S-W terrace. Sleeps are available for up to 4 people. The double bed in the bedroom is 180 x 200 cm in size, the comfortable double sofa bed in the living area 160 x 200 cm. The dining area of ​​the apartment has been equipped with a complete kitchenette. 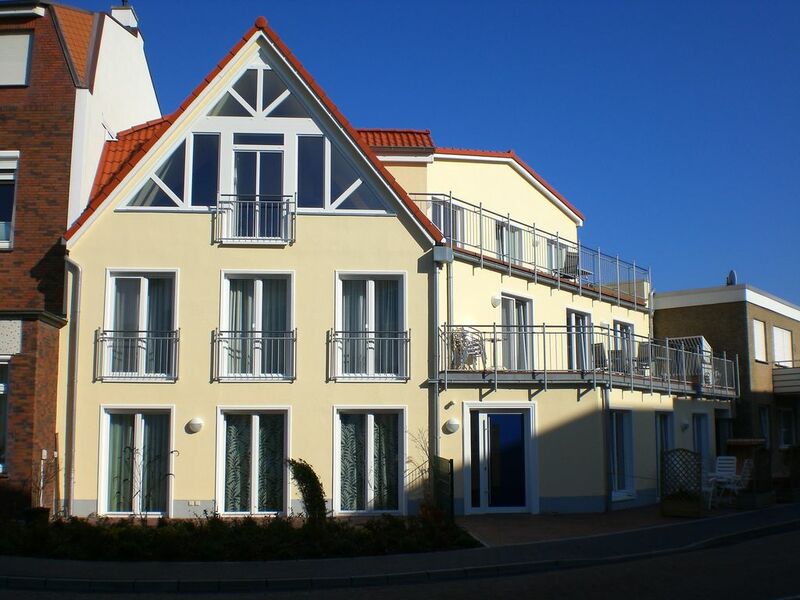 The apartment is located in the city center (zone 1) of Norderney. Shops for daily needs (eg Bakery, restaurant) are only about 150 m, the nearest bus stop (west beach) about 100 meters away. The spa and the west beach are within walking distance. In the bathroom you will find a spacious shower with a low entry height. Die Ferienwohnung war sehr sauber,es war alles vorhanden was man in einer Wohnung braucht. Die Wohnung ist mit Liebe ausgestattet. Wir hatten noch keine Wohnung bei der wirklich alles gepasst hat, nun haben wir sie gefunden. Ideal gelegen, wenige Schritte zum Weststrand, zum Bade:haus und auch ins Zentrum. Ruhig gelegen, gut isoliert Sauber und ein Bad, das auch noch den Namen verdient. Die Schlüsselübergabe klappte auch perfekt und wir bekamen auch noch den Tipp wo es das Beste Bier der Insel gibt - einmal umfallen und man ist auch im Brauhaus der Insel. Eine schöne, sehr gut ausgestattete, empfehlenswerte Wohnung. Die Wohnung und das ganze Haus sind sehr gepflegt und modern. Die Handtücher können nach einer Woche vom Verwalter gewechselt werden. Das Kinderbett passt in den Elternschlafraum, so dass man das Wohnzimmer abends noch zu zweit nutzen kann. Auch die Terrasse ist mit Kind ideal, da ebenerdig und komplett umzäunt. Im Flur ist Platz für den Kinderwagen. Bäcker und Weststrand um die Ecke. Außer W-LAN haben wir absolut nichts vermisst. Already on 1. May 1800, the seaside resort Norderney was officially opened. At that time, 250 guests were on site, some of whom had to spend the night in tents. Since then, more and more guests enjoy the special flair of the island. On the one hand, Norderney impresses with its dunes that border the rugged North Sea, on the other hand, the city offers a successful mix of bathing, culture, spa and adventure holiday. Norderney is the second largest of the 7 inhabited East Frisian Islands. The island is about 14 kilometers long (east-west direction) and max. 2.5 kilometers wide (north-south). Approximately 6000 inhabitants live permanently on the island. A total of 85 percent of the island area is part of the Lower Saxony Wadden Sea National Park, which has been under construction since the 26. June 2009 is a UNESCO World Heritage Site. The originality of the dunes, the protection of the beach and the preservation of the Wadden Sea are given here. Nature lovers can the island u. a. explore on specially marked nature trails.